Cilantro/Coriander - Coriandrum sativum - Annual; Culinary; The leaves are known as cilantro and lend a musky taste to Mexican dishes. 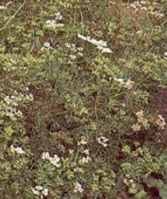 When the plant reaches maturity, it bears tiny white blooms which later become seed pods. The dried seeds are called coriander and are used in Middle-eastern dishes. Full sun; plant height: 2-3ft.